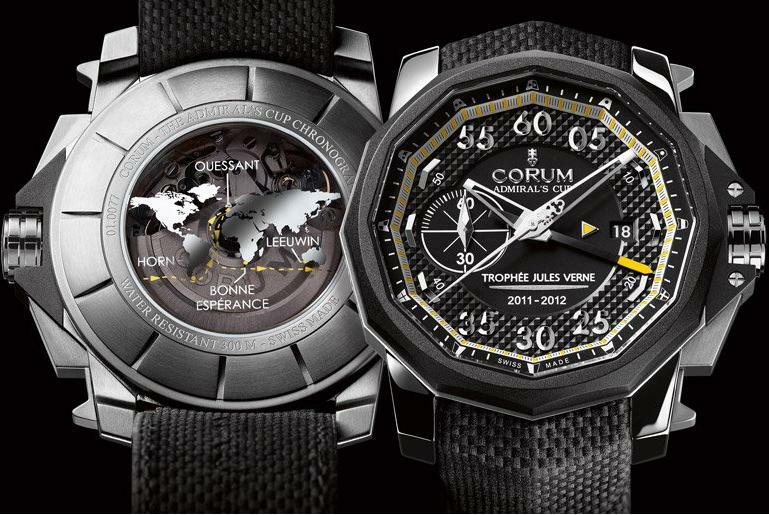 45 days, 13 hours, 42 minutes, 53 seconds: that’s the new reference time for the Jules Verne Trophy – the round the world trip by crew with neither stops nor help – recorded by famous watchmaker, Corum. In its capacity as partner and official timekeeper for this legendary sailing adventure, the Swiss watch brand accompanied sailor, Loïck Peyron and the Maxi BanquePopulaire V crew in achieving their prestigious record. To pay tribute to the BanquePopulaire team’s great victory, Corum has just awarded the 14 crew members, as well as their onshore router, a special brand new model called the “Trophée Jules Verne 2011-2012”. On January 6th 2012, at 23 hours, 14 minutes and 35 seconds, the watchmaker stopped its chronograph to record the victory achieved by the 14 men during their round-the-world race against the clock. 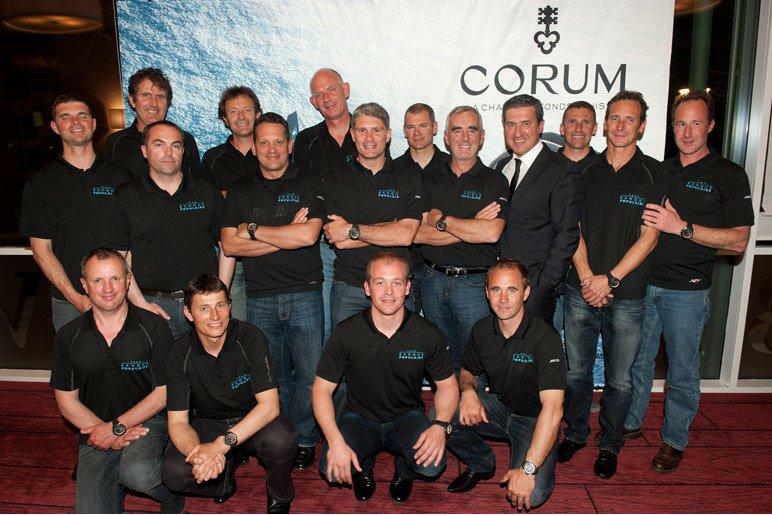 Corum presented each member of the Maxi Trimaran crew, as well as their onshore router,with an Admiral’s Cup Seafender 48 Chrono Centro, a watch model from the Admiral’s Cup collection – a flagship line origianlly launched in 1960 – equipped with a chronograph function. The dial bears the inscription “Trophée Jules Verne 2011-2012” and the back of the watch is engraved with an outline of the route. Each model is personalized with the individual crew member’s name. The House of Corum invited the crew of the Maxi Trimaran Banque Populaire V to La Chaux-de-Fonds in Switzerland on Monday, April 2nd 2012, in order to present them with their “trophy”, a powerful symbol that is destined to be a reliable lifelong companion. CEO of Corum, Antonio Calce returned the compliment: “It is a great pleasure to see the Maxi Banque Populaire V team gathered together at Corum in La Chaux-de-Fonds to get to know our workshops. The fact that each team member has personally come here to receive his Jules Verne trophy watch, inscribed with his name, is a very strong message." What a memorable moment of orologi moda the team member should be proud of!